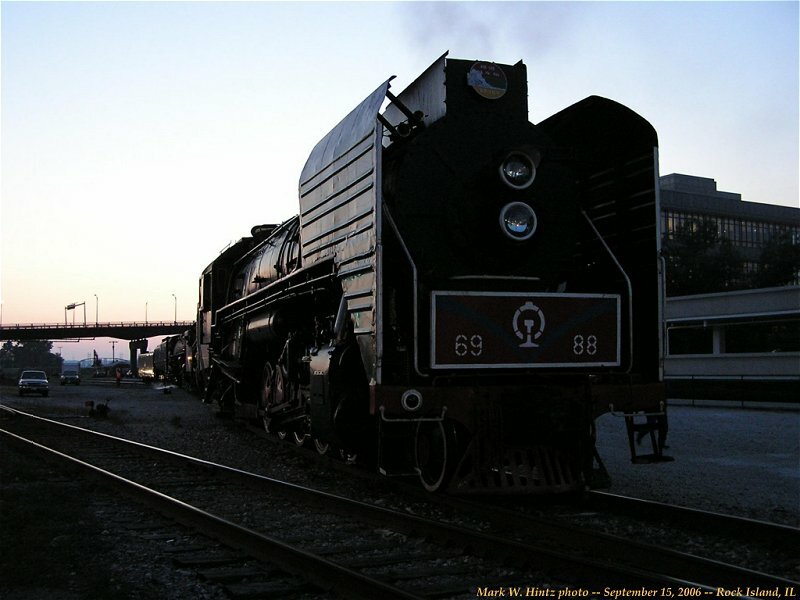 In June 2006, Railroad Development Corp., parent company of the Iowa Interstate RR, imported a pair of Chinese 1980s-built 2-10-2 Class QJ steam engines, for potential sale in the United States. A fair amount of excitement followed the steam engines as they were loaded onto flatcars in Houston, and made their way up to the Quad Cities, through which the IAIS runs. After FRA inspection (the engines were brought up to American standards before leaving China), the two steamers spent much of August testing on freights on Iowa Interstate. The biggest show for these locomotives, however, would be the RiverWay 2006 excursions September 15-17, celebrating the 150th anniversary of the Rock Island Railroad's bridge across the Mississippi River, the first rail bridge over the waterway. Milwaukee Road #261 was originally scheduled to lead the excursions, but took a bit of a back seat to the two newcomers as they led their "show-off" excursion runs. The trips were a great success, as they were sold out, and it was a real treat to see 261 helping out as the third engine in the steam triple-header on Saturday's excursion! Click here to start viewing the album, or click on a thumbnail below. Press F11 to toggle full-screen view (in most browsers).